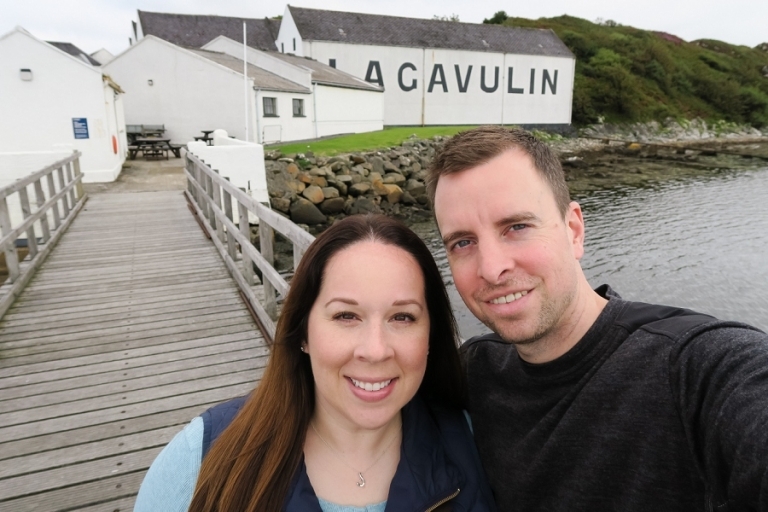 The plans for our entire Ireland & Scotland 2015 trip began with Chris’s idea to visit the Lagavulin distillery on Isle of Islay. That one thought quickly turned into spending a week in Scotland, which then spiraled into adding a second week so we could see Ireland, too, since we’d be nearby. And once we arrived on Islay, we decided we might as well see all eight whisky distilleries. You know, since we were right there. Eight whisky distillery visits over the course of three days might sound like a tight schedule, but it can be done! With a long weekend on Islay, Chris and I stopped by each distillery, we did a combination of tours and/or tastings, and we still had time leftover for seeing Islay. You probably could do a tour plus tasting at each distillery if you planned your three-day schedule carefully; just be mindful of the differences in opening hours. For instance, opening hours and days change throughout the seasons for most distilleries, and Kilchoman is always closed on Sundays. And of course you’ll want to be mindful of your own tolerance. From our experience the tastings typically included 3-5 drams measuring about a finger or more, so if you’re hitting three or more distilleries in one day it can add up to several ounces. Please drink responsibly! There are taxis and tours available on Islay if you need a designated driver. Most visitors combine visits to the three southern shore distilleries together (Lagavulin, Ardbeg, and Laphroaig) for proximity’s sake. You can even walk the distance among these three. We planned the 4.5-hour Water-to-Whisky Experience with Laphroaig for a half day before leaving the island though, so we didn’t end up visiting those three in one day. As for the other five, you could easily group the two northeastern guys together on one day (Bunnahabhain and Caol Ila), and the two western distilleries on another (Bruichladdich and Kilchoman). Add centrally located Bowmore to either of those pairings and voilà – a great three-day schedule in whisky wonderland. We started off our itinerary with a pre-booked premium tasting tour of Lagavulin who sadly doesn’t allow photography or videography on their tour. Don’t leave your cameras behind though – you can walk out to the dock and get great shots of the exterior. The tour group was permitted to take photos in the tasting room as well. And speaking of tastings, the guided session of five different whiskies was quite thorough with tasting tips and notes for each whisky. Bonus: as the designated driver, Lagavulin allowed me to tour the distillery for free. Did I confess yet that I’m not a whisky connoisseur or even a whisky drinker? Well, I’m not, so if I had to choose my favorite distillery it would be based on merits other than the whisky itself, and I would choose Ardbeg. I loved the atmosphere of the bar and the adjacent restaurant where we ate a delicious lunch, and I enjoyed the outside experience even more. It helps that we had an unusually beautiful day weather-wise. I sat with Chris at a picnic table and soaked in the picturesque surroundings while he worked his way through a five-dram taster. I will always remember the drive to Bunnahabhain. I nervously drove up and down the twisty, narrow mountain roads to the distillery wondering how employees do that commute daily! I guess it’s not terribly bad if the roads aren’t busy and/or if you’re an accomplished left-hand side driver. Islay wasn’t my first rodeo when it comes to driving on the left, but it’s still not super comfortable for me and I’m not crazy about it on narrow roads. Thankfully I only had to pass another car once or twice and did so without incident. Well, without major incident anyway – I did skid on some gravel at one point and got my heart pumping a bit! In the end, I got us safely to Bunnahabhain and back, and Chris enjoyed sampling several whiskies here. We stopped by without any reservations and were able to join a very generous impromptu tasting in the gift shop. Since we decided at the last minute to visit all eight distilleries, we didn’t have anything booked in advance with the exception of Lagavulin and Laphroaig. While most visitor centers were able to accommodate us without reservations, tastings and tours definitely need to be booked in advance at Caol Ila. We popped in anyway just to check it out, and we were graciously offered a complimentary mini tasting. So for the full Caol Ila experience, check their schedule and be sure to reserve in advance. In the things-that-probably-don’t-matter-as-much-to-whisky-fans department, Bruichladdich wins my vote for most interesting branding. I noticed right away that Bruichladdich sported an eye-catching modern typeface in bold whereas the other brands leaned towards a more traditional vibe. I asked about it in the Laddie Shop while Chris participated in a tasting, and found out that they rebranded in 2001 as part of a progressive and innovative initiative. Bruichladdich is also your opportunity to try an Islay spirit other than whisky since they distill and bottle their own gin. We only popped by Kilchoman briefly since their hours didn’t quite jive with our schedule. It’s the newest distillery on the island and getting to their location is a fun drive through the countryside with a bonus of being close to Saligo Bay beach. As I mentioned, Kilchoman is closed on Sundays, but the farm distillery offers plenty of tours and tastings in their regular schedule Monday through Saturday. They also have a cafe, so along with Ardbeg this is one of the distilleries you could easily combine with lunch. Since we stayed in the cottages at Bowmore (more on this in the next post), we simply moseyed into their visitor centre just steps from our accommodations. We sat at a cozy bar where Chris selected a trio of tasters from the menu and it was there that I discovered something whisky-related that I enjoyed drinking: Drambuie. Blended and bottled by Bowmore in their Glasgow location, sweet and fiery Drambuie reminded me of liquid red hots. And since we only needed to walk back to the cottage, I was able to participate in the drinking and merriment. Chris discovered something, too: Bowmore 25-year, one of the best whiskies he tasted on the entire trip. Chris and I finished our Islay adventure by participating in the ultimate tour: the 4.5-hour Water-to-Whisky Experience at Laphroaig. If you want to know everything that goes into the Islay whisky distilling process, this tour is for you. It’s an investment in price and time, but you simply won’t find a more in-depth and hands-on experience, and you’ll walk away with an impressive knowledge of whisky making from start to finish. Our tour started with a walkthrough of the distillery itself where photography is not only allowed, it’s wholeheartedly encouraged! And an indulgent sensory theme continued throughout the 4.5 hours – touching, smelling, and tasting were all part of the tour. We stood inside the kiln, scooped barley from the floor malt, visited the water source, cut peat, and tasted special cask samples that will never be for sale. After learning about the distillery process, we hiked out to the water source and enjoyed a picnic lunch with several Laphroaig samples. (Note: The brisk hike is maybe a mile roundtrip on easy enough terrain, but do step carefully and I recommend wearing the provided Wellies even if it hasn’t been raining.) Be sure to fuel up at lunch, because next comes the hard work! You’ll have a go at cutting peat out in the field, and the satisfaction of knowing you contributed to the smoky flavor of someone’s future whisky. At the end of the tour, we sampled several different whiskies straight from the casks and had the opportunity to use a valinch to pour our own bottles. As a designated driver I passed on samples throughout the day, but Laphroaig sent me home with a dram of every single whisky that everyone else tasted! We didn’t make the trek over to neighboring island Jura, but Chris did have a chance to sample a Jura whisky on the ferry back to mainland Scotland after our Islay weekend came to an end. If you want to include the Jura distillery, I’m guessing you’d want to add a fourth day. 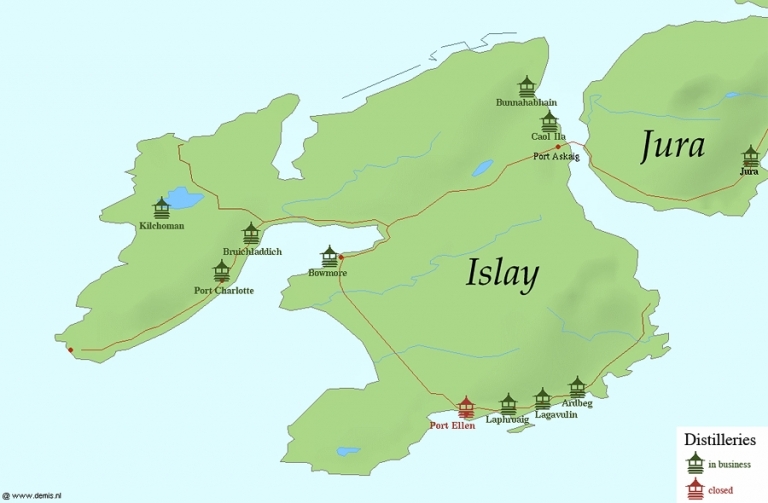 As for the three-day eight distilleries Islay itinerary, I recommend booking at least some tours and tastings in advance to avoid any disappointment, depending on what is on your must-taste list. As for Chris’s final verdict, Lagavulin remains his favorite overall with Laphroaig as a close second, and he also recommends Bowmore 25-year as a must-try. If you really want to be totally immersed in all aspects of the whisky making process, don’t miss Laphroaig’s Water-to-Whisky Experience. 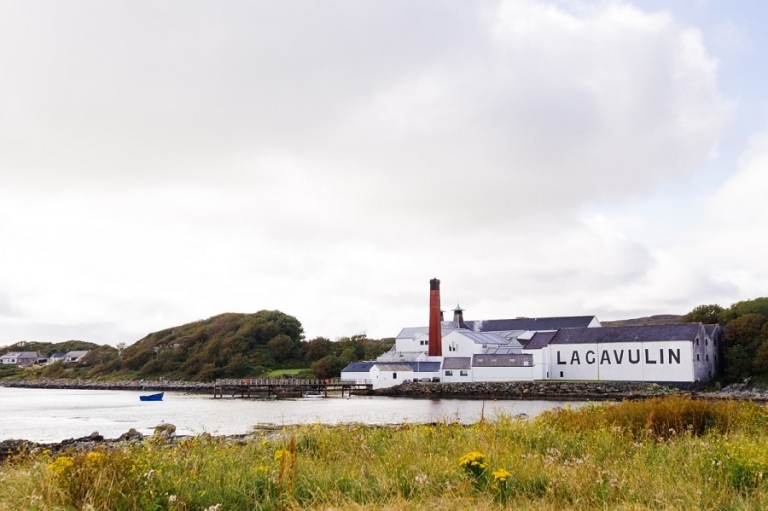 Let us know if you visit Islay and what you think of the island’s own whisky trail! Susan - Zarina – that works out perfectly! You will have such a wonderful time!